Infinix Hot 4 Lite (X557) Price and Specs: Smartphone manufacturer Infinix Mobile presents another another master piece tagged Infinix Hot 4 Lite. The 5.5-inch HD screen display with 12 ultra-bright backlight LEDs comes with a 720 x 1280 pixels. Infinix Hot 4 Lite (X557) comes with a 5 megapixels front camera with flash for taking selfies. On the rear, the Infinix Hot 4 Lite has an 8 megapixels camera with LED flash and multiple shooting modes will capture your finest moments. HOT4 Lite has Dirac Stereo WideningTM which brings depth to a small speaker setup by extending the sound beyond the speakers to create a wide soundstage that you would not expect from mobile devices. Infinix hot 4 lite comes with Android 6.0 (Marshmallow) on a Mediatek MT6580 chipset running on a 1.3GHz quad-core processor with 1GB of RAM. It has the Infinix exclusive customized operating system based on Android M tagged XOS. Providing an excellent interactive experience with innovative features such as custom themes, smart cleanup, and Freezer. 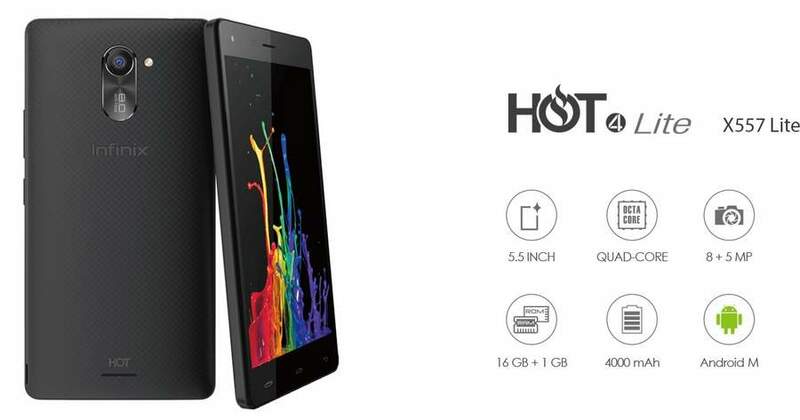 Hot 4 Lite is powered with a 4000 mAh battery with XOS energy saving utility support. However, the battery can support to 18 hours talktime and the battery can last an average user for up to 2 days. The phone also supports fast charging. The smartphone has a 16GB internal storage and can be expanded up to 32GB via microSD memory card. Infinix hot 4 lite is a Dual Micro SIM smartphone with Connectivity options like Wi-Fi, Wi-Fi hotspot, GPS, A-GPS, Bluetooth version 4.1, GLONASS, USB v2.0, USB OTG. Sensors on the phone include Accelerometer, Gyro, Proximity and Compass. Connectivity: Bluetooth 4.1; Dual micro SIM; USB OTG Wi-Fi a/b/g/n/ac; GPS. Infinix Hot 4 Lite has been launched and is also available in Nigeria, Ghana and Kenya. It can be purchased at the price range of ‎₦34,500.00 to ₦55,580 across Nigeria. In Kenya Infinix S2 Pro sells for Ksh 9,399 and the Ghanians can as well have it at 370 Ghanaian Cedis.